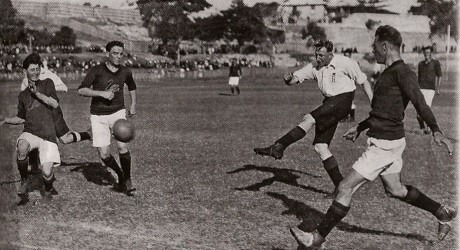 Jack Elkes of England shoots for goal in the match against Western Australia at Fremantle Oval on 9 May 1925. The Western Australian players from the left are T Boyle, Richard Utting, the skipper, and Harold Boys. Source: Richard Kreider, Paddocks to Pitches, p. 453, courtesy of Harold Dale Boys. Ever since organised Association football began in Australia in the nineteenth century one of the aims of those playing and administering the game was to have an Australian team go on tour to the United Kingdom or have a team from there tour Australia. Fund raising for such a tour began in the 1880s and the issue was on the agenda of state and national bodies until it finally happened in 1925. Distance, cost and the fact that a team would have to be away from the United Kingdom for several months ensured that it did not happen till then. 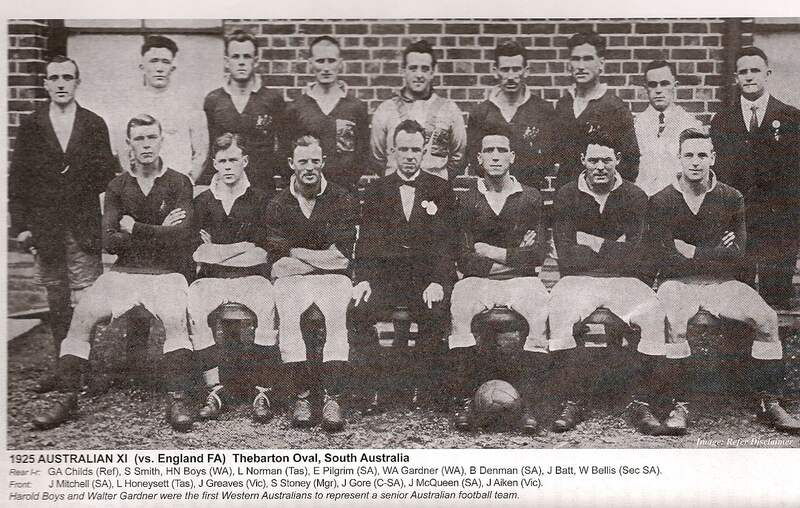 In 1925 the Football Association in London sent a strong representative team to Australia which arrived at the beginning of May and played 25 games before leaving again in early August. Several of the matches were regarded as promotional exercises and even the internationals were deemed to be ‘B’ rather than ‘A’ games and hence are not included in the list of caps awarded to the Australian or English players who took part. This is a slight on members of both teams. An Australian team against England at Thebarton Oval in South Australia in 1925. Players names on picture. Source: Richard Kreider, Paddocks to Pitches, p. 74. The tour began and ended in Perth and included matches against state teams and five test matches against Australia. England won all 25 games and scored 139 goals and conceded only 14. Sometimes the Australian opposition were lucky to get nil! The squad was not a full England eleven but it did include some excellent players. Tom Whittaker of Arsenal was a superb full back and later a long term and successful manager of the club. Stan Seymour had a similar career on and off the field with Newcastle United. Stan Seymour playing for Newcastle United. Source: Paul Joannou, The Black and White Alphabet: A Complete Who’s Who of Newcastle United, p. 364. The full list was: Harry Hardy (Stockport County), Teddy Davison (Sheffield Wednesday), goalkeepers; Cecil Poynton (Tottenham Hotspur), Tom Whittaker (Arsenal), Stan Charlton (Exeter City, full backs; Charlie Spencer (Newcastle United), Joe Hannah (Norwich City), Len Graham (Milwall), Bill Caesar (Dulwich Hamlet, but joined Fulham on his return to England), Jimmy Hamilton (Crystal Palace), half-backs; Stan Seymour (Newcastle United), Billy Sage and Jack Elkes (Tottenham Hotspur), Bert Batten (Plymouth Argyle, but joined Everton on return), forwards; and Ernie Simms (Stockport County), Charlie Hannaford (Clapton Orient, but joined Manchester United on return), Jimmy Walsh (Liverpool), utilities. The team was managed by John Lewis and Mark Frowde and M Atherton of Blackburn Rovers was the trainer. Bill Caesar was the only amateur in the team, and some wag said that explained why he was able to get away on tour, but he joined Fulham on his return, though he only recorded one first team game. 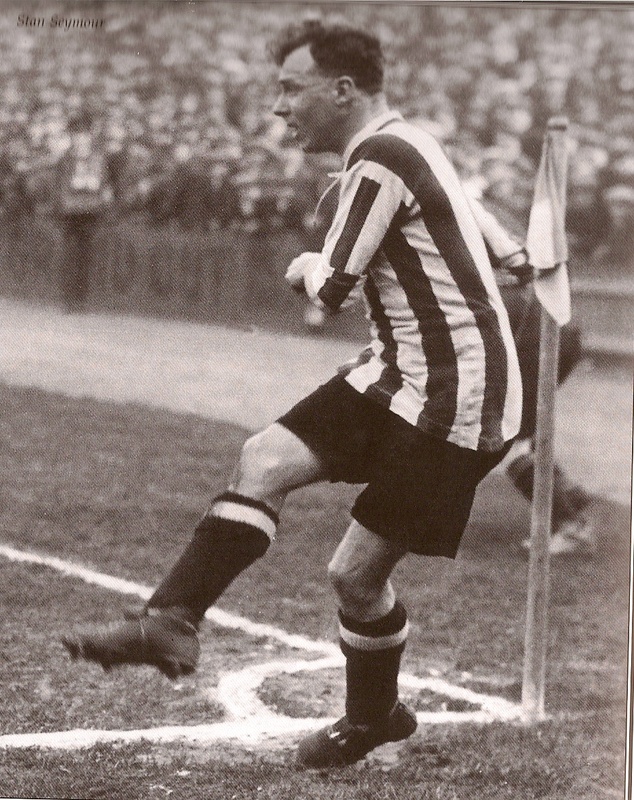 Bert Batten was Irish, the only non-English player in the squad, and he scored 47 or 49 goals on the tour (sources differ) and joined Everton when he got back to England. He too only managed a single first team appearance. But if these were marginal players in England, others, as noted above, went on to significant careers in the game. The closest Australia came to holding the English was in the test match at the Agricultural Showground in Sydney on 4 July. Australia had George Cartwright in goal, Frank Gallen, T Faulkner, Charlie O’Connor, A Edwards, Harry Spurway, Stan Bourke, Percy Lennard, J Smith, H J Sheringham and R McNaughton. W A Wright refereed. England won, but only by two goals to one. 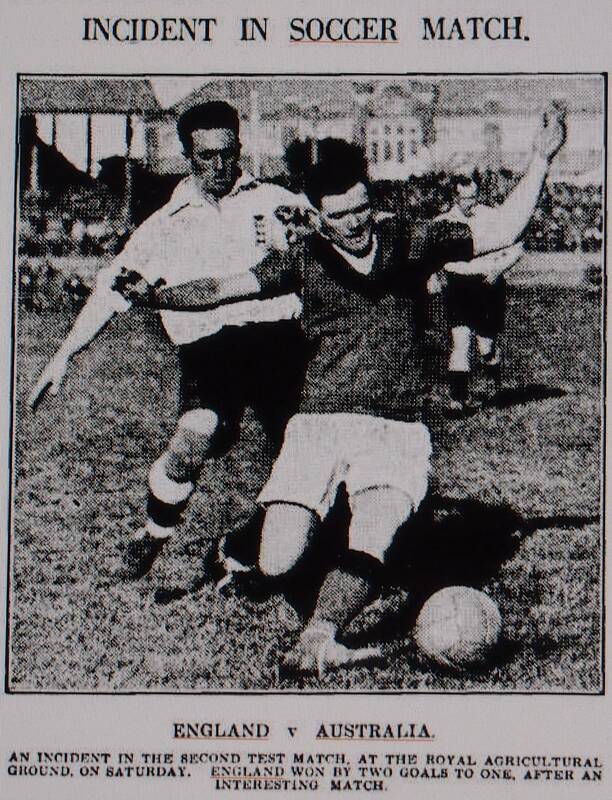 Ernie Simms opened for England and Stan Bourke equalised for Australia. It was one-all until Jack Elkes scored the winner. Both sides missed penalty kicks. Sheringham was injured and had to the leave the field. 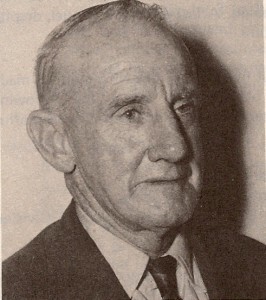 The Australians had sought to be able to introduce substitutes but this was turned down by the English as being against the rules of the game as they stood at the time. The attendance was given as 26,000. Takings at the game of around £1,400 suggests there were a lot of freebies. However that sum brought the aggregate for the tour to that point to around £16,000, leaving only another £2,000 required to ensure a profit overall. Sir Harry Lauder, the Scottish music hall singer and comedian, was among the spectators. Incident in the Sydney test match between Australia and England on 4 July 1925. Sydney Morning Herald, 6 July 1925, p. 12. The results in the other tests were more one-sided in favour of the tourists. In Brisbane on 27 June, England won five-one, then eight-two in Maitland on 11 July, and five-nil in Sydney again on 18 July. The final test in Melbourne on 25 July was a two-nil win to the visitors. England was awarded three penalty kicks and missed two of them. Charlton scored with the second penalty after a foul by Aiken to put England ahead in the 25th minute. 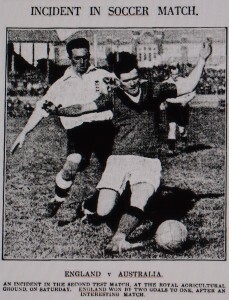 Batten scored the other England goal deep in the second half with a shot which slipped through keeper Robison’s hands. Apart from that Robison and his full backs Mitchell and Aiken were excellent while Masters and O’Connor were the other Australians who stood out. The full Australian line-up was probably, S Robison, Mitchell, Aiken, Morrison, Eccles, Phillips, O’Connor, Judy Masters, A Edwards, Tom Thompson, R McNaughton. Harry Spurway was also mentioned in some reports. Judy Masters. Source: Sid Grant, Jack Pollard’s Soccer Records, p. 173. Australian teams in those days were selected by state officials and were seldom the strongest line-ups that could have taken part. Judy Masters, one of the stars of the Australian game between the wars, did not play in the Sydney July test for example, though he did turn out in three of the other test matches. Faulkner was the only non-New South Wales player in the Australian line-up on 4 July, and while NSW was by far the strongest state at the time, it is hard to believe that there were no other players worthy of selection. The English manager, John Lewis, later criticised the Australians for bringing on substitutes and breaching the rules of amateurism by paying players £1 per day, a £5 bonus and compensation for time lost at work. He said he would report the Australian Soccer Association to the FA. In the program for the match against West Australia on 9 May 1925 there were two pages devoted to “‘Off-side’ Simplified”. One wonders how long a full explanation might have gone on. My thanks to Richard Kreider for assistance with this column.